Pancakes and apples are a great combination, particularly if you caramalise the fruit in a little butter and sugar first. I add fresh thyme leaves and lemon, which give the apples a really floral note. egg and half the milk and whisk until you have a smooth thick batter. Now add the remaining milk and whisk again. Let it rest for 15 - 20 minutes, then check the consistency again. If it’s thickened up a bit, add a dash more milk. Meanwhile peel quarter and core the apples, then cut the quarters into thick wedges. Heat a medium pan over a medium heat. Add the butter and when bubbling add the apples, lemon zest and thyme. Fry them for a few minutes on each side then sprinkle over the sugar. When everything is thick, bubbling and sugary squeeze in the lemon juice then remove the pan from the heat. To cook the pancakes, heat a non-stick frying pan or crêpe pan over a medium heat. When it’s hot add a dash of oil, make sure it coats the bottom of the pan. Add a small ladleful of batter – just enough to coat the base of the pan – and swirl it around quickly until it covers the base. Cook for a minute or so, until lightly coloured underneath, then flip over and cook for a minute or so more. 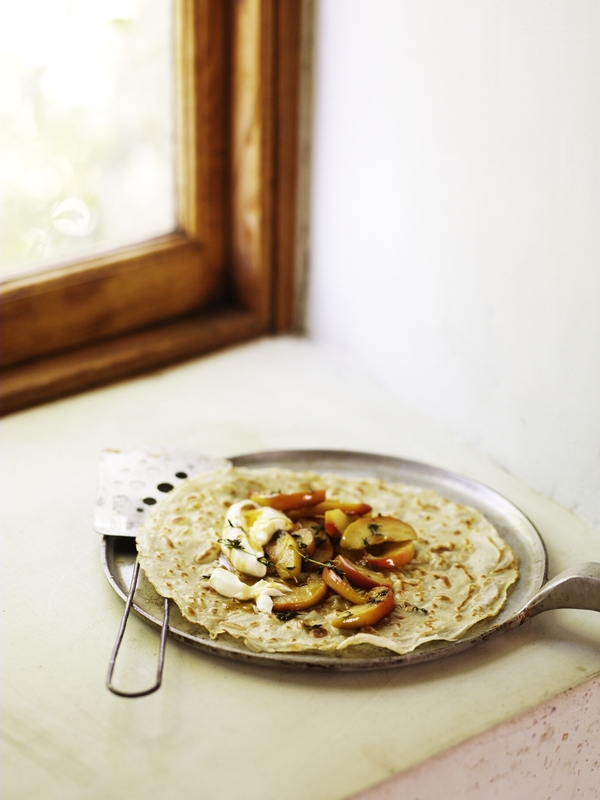 Serve the pancakes with a spoonful of apples and some of their buttery sugary juices and some yoghurt, if you like.